Large Teardrop Flag - 42" x 119"
Flags are quickly becoming one of the popular and most innovative ways to deliver your message. It is a highly customizable and innovative way to promote your product, company or organization. The flags are designed to be 100% effective. Your message will achieve its target audience on the stillest day and even in an indoor environment. Also, it will not collapse or wrap around the flag pole like an ordinary flag. Available with single sided or double sided artwork. Replacement fabric skins offer the flexibility to change your message or image with ease, and for a minimal cost. 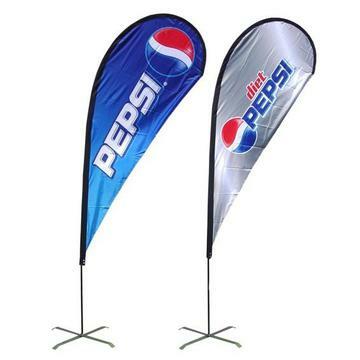 Ideal for both indoor and outdoor events, trade shows, retail stores, general and off-site promotions and auto dealers, as well as corporate and sporting events.